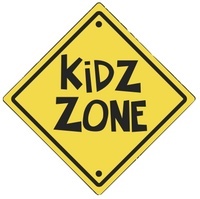 THE BOMBERS KIDZ ZONE IS A PLACE WHERE KIDS OF ALL AGES CAN TAKE A BREAK FROM THE ACTION AND HAVE A LITTLE FUN... OR SPEND THE WHOLE GAME THERE AND HAVE AN ENTIRE EVENING OF FUN! 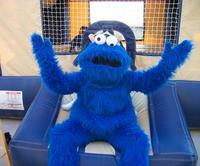 The Bombers Kidz Zone is located on the first base side of the ballpark behind the grandstand. Taking advantage of the expansive Bombers Stadium, the Kidz Zone has room for games, activities, or just space to run and play. 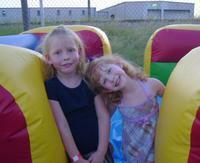 The Bombers Kidz Zone features inflatable games for kids and fans of all ages. 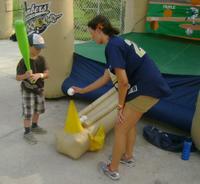 Fans can test their fastball with the speed pitch, or test their skills at the plate with a neat hitting game. 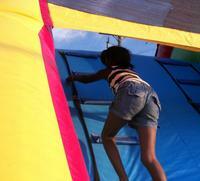 And the Kidz Zone wouldn’t be complete without a moon bounce and an obstacle course for our younger fans to enjoy. Please register your child or children below in order for them to receive their free wristband and to be able to enjoy the Bombers Kids Zone! KaBoom will visit every game to check in on his favorite fans, the kids!